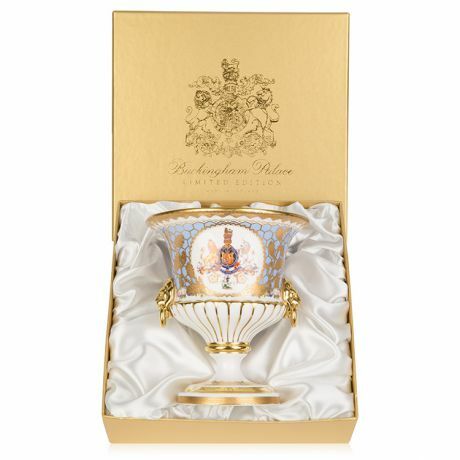 The design of this limited edition lionhead vase is based directly on the famous Rockingham Dessert Service, still used today for State Banquets. 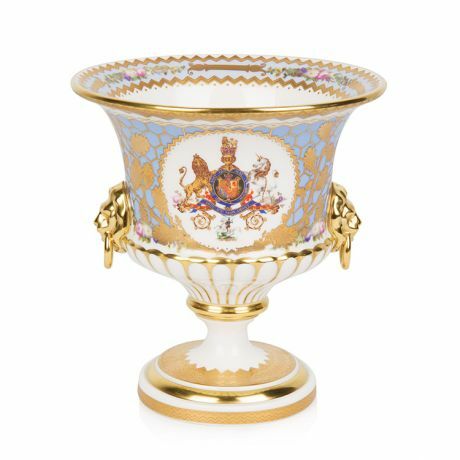 Commissioned in 1830 by William IV from the Rockingham works in Yorkshire, the service was first used at Queen Victoria's coronation banquet in 1838. It was possibly the most ambitious ever produced by an English factory, taking seven years to complete. The decoration shows the coat of arms of William IV, surrounded by the national flowers and a border of oak leaves and acorns. 16 x 14.5 x 14.5 cm. Bespoke box 16 x 22 x 22 cm.